Understanding Cancer from a Systems Biology Point of View: From Observation to Theory and Back starts with a basic question, why do we sometimes observe accelerated metastatic growth after resection of primary tumors? Next, it helps readers understand the systemic nature of cancer and how it affects treatment approaches and decisions. The book puts together aspects of cancer that many readers have most likely never combined, using unfamiliar, novel methods. 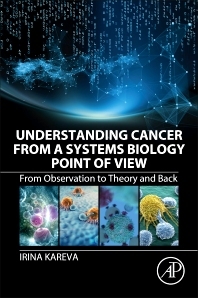 It is a valuable resource for cancer researchers, cancer biologists, mathematicians and members of the biomedical field who are interested in applying systems biology methodologies for understanding and treating cancer. Irina Kareva received her PhD in Applied Mathematics for Life and Social Sciences in 2012 and was a Postdoctoral fellow at Center of Cancer Systems Biology (Tufts University School of Medicine). She has been working in mathematical modelling of cancer as an evolving ecological system throughout her career, focusing on understanding cancer as a complex systemic disease rather than just disease of the genes. Several of the theoretical constructs that she proposed have been subsequently independently verified experimentally. Dr. Kareva strives to incorporate knowledge from molecular biology, evolutionary ecology, mathematics, game theory and even palaeontology to find approaches to understand and treat cancer to achieve long term positive outcomes. Dr. Kareva published a book entitled Niche Construction, Sustainability, and Evolutionary Ecology of Cancer (Scholar’s Press, 2015) and has published in several important journals such as Ecology and Evolution of Cancer, Journal of Theoretical Biology and Cancer Research. She was Distinguished Lecturer at Rochester Institute of Technology (2016) and gave a TED talk (2017) on using mathematical modeling to better ask biological questions.